Born in Surrey, British Columbia on January 3rd, 1973, Cory spent the better part of his childhood reading comic books and listening to music. He took up the guitar in his teen years, and went on to study Fine Arts at Kwantlen University College. Having found his true calling, Cory continued his education in art, and in the year 2000, graduated with a Bachelor of Fine Arts from Emily Carr Institute of Art and Design. While both his passion and talent cover a broad range of artistic disciplines ranging from painting, printmaking and drawing in a variety of mediums, to comics, cartoons, animation, and web graphics, his artistic flair comes shining through in his caricatures. 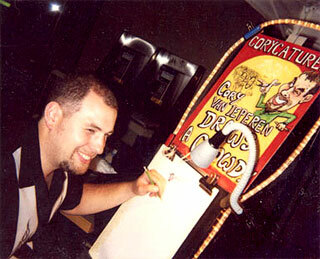 Since leaving Emily Carr, Cory has continued to hone his skill and has become an accomplished caricaturist. His unique ability of catching his subject's personality is evidenced by the many conventions, weddings, parties and other events he's been asked to attend, much to the pleasure of the guests. Cory recently held a position of Art Director, developing, producing, illustrating and animating online 'cartoon' video presentations for financial professionals and the investment market. He has taken this experience to become a large part of the team as Lead Artist & Creative Advisor for the Green Garden Gang. He continues to grow as an artist and illustrator, branching out to different styles of work and different markets where he can make himself available. Cory also somehow manages to pursue his second love, which is music. He's actively involved as a singer/songwriter/guitarist with Vancouver original rock band, SKOOKUM, of which he's a founding member.